The Majestic Diamond II™, represents the state of the art in Audio Monitors. This is a dynamic 2 way monitor with accurate full range response,wide dispersion, near-field listening capability and low frequency extension now below 30 Hz. The Majestic Diamond II™ solves many problems that must be addressed before sound reproduction can benefit the consumer on such a thorough scale in today’s modern lifestyle. Audio is actually more involving than a high definition picture just ask any serious audiophile and now it is possible to have the best of both worlds. The sound stage should tell you what is going on even if a picture is not present. A musical event is wonderful when we close our eyes and imagine the performers in front of us and feel the ambiance of the hall. Some feel that this would be better than watching it because you can be there with your eyes closed. The Majestic Diamond II™ is just such a product that rewards you with the pleasure of sound well integrated with your lifestyle. Sure you would like a dedicated sound room but it would be nice to share the experience with others or listen from a variety of positions in almost any room that you have now. This is a must when you combine video with your audio source and people are everywhere standing, seated even on the floor watching the HDTV. This describes a typical family setting or social gathering with people perhaps conversing while enjoying the music or movie. The Majestic Diamond II™ multi-way audio monitor uses the Embedded Transmission Line (ETL™) technology, which controls any internal resonance. You will know that this handsomely constructed monitor means serious business the moment that you remove it from packaging. 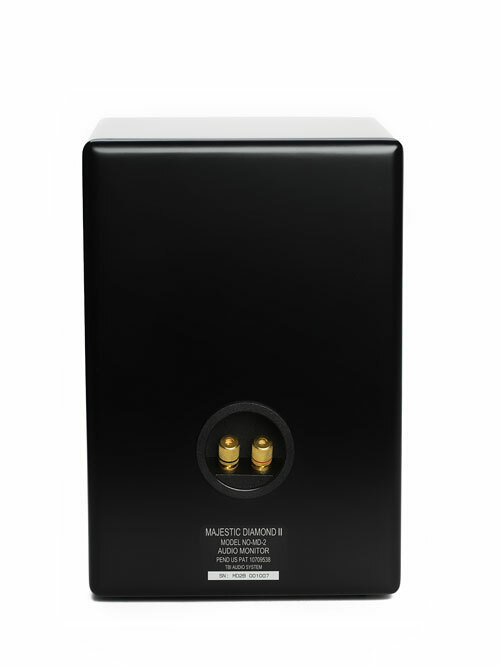 You will notice the quality 5-way gold-plated binding posts, which allow many ways to connect the speaker to audio cables. Accomplishing stellar woofer performance demands a neutral high frequency section to extend the coherent low frequency foundation into the highest frequency ranges. The conical based 2-inch PPM tweeter incorporates an aluminum phase plug to enhance higher frequency dispersion while a 200 Hz low frequency limit assures that the driver’s main resonance does not influence its output. The relatively high 4.5kHz crossover point maintains a minimum cone travel, which is desired for this driver. 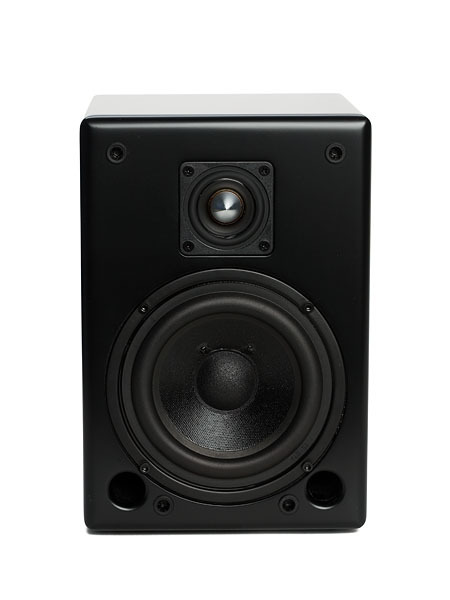 This tweeter when used in the ETL™ internal acoustic environment becomes neutral and matched to its companion woofer. How is it possible to accomplish such a goal when typically woofers are just plain different from tweeters in all respects? ETL™ technology accomplishes this by normalizing the internal operating environment of each driver. The industry has been searching for harder materials to minimize the breakup in tweeters even by using synthetic diamonds. The best sound comes from natural materials such as paper or a closely engineered comparable material such as the PPM cone employed in the Majestic Diamond II™. Our ETL™ technology precludes the need to use rigid and artificial materials by supporting the tweeter with constant pressure that prevents axial mode breakup from occurring. The voice coil now has help to assure that the tweeter remains a piston throughout its frequency range. The crossover point comes into question again when describing the tweeter’s contribution. It is important that the woofer and tweeter maintain similar dispersion characteristics at and around the crossover frequency. It would also be good to be able to maintain the important similar characteristics right through the audible range. The ETL™ maintains that similarity even though the drivers are of a different frequency range and construction. Why do we choose a 4.5 kHz crossover point? 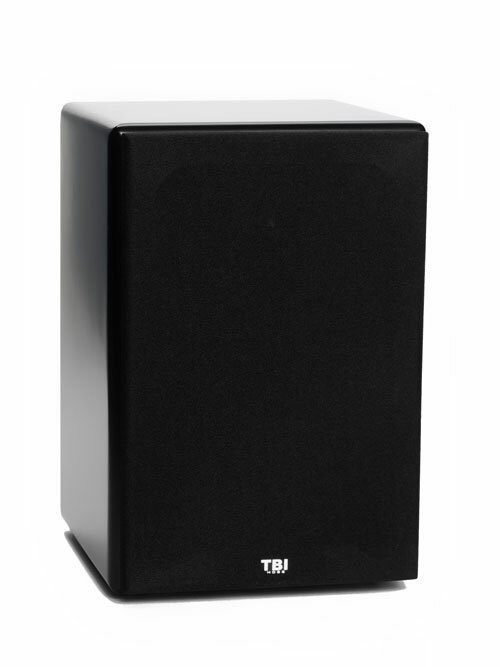 The woofer must crossover when its dispersion coverage is similar to the tweeter. This assures that there is a seamless transition at and about the crossover point with the woofer-tweeter radiating characteristic essentially identical in this range. 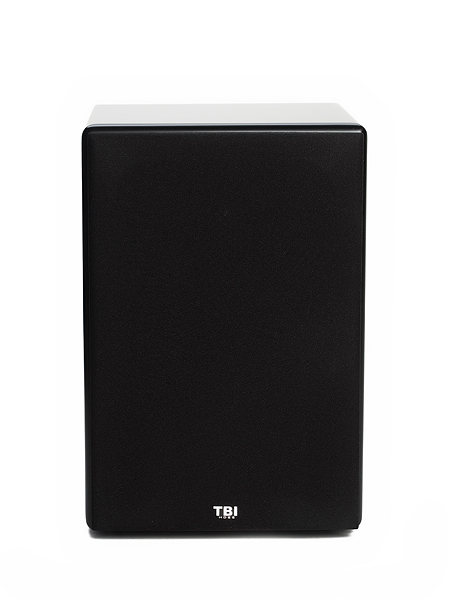 This also allows us to use a simple 6db/oct high pass slope for the woofer, which minimizes electrical phase shift. The Majestic Diamond II™ sounds as if it is a single driver speaker even at very close distances while improved coherency establishes a slower sound decay with distance than with existing loudspeakers. This is because the internal pressure returned to each driver maintains the consistent velocity differential with the ambient at all frequencies. The drivers have similar cone shapes affording similar dispersion characteristics in the crossover range. The elimination of breakup modes in the woofer allow for precise crossover design and operation when blending with the tweeter even when high dynamics are present. With the acoustic impedance maintained for both drivers the acoustic presentation is neutral to responses from reflections to maintain coherence in any environment. An inherent benefit of ETL™ technology is that of maintaining constant pressure for the diaphragm at high sound pressure level (SPL). This maintains a linear dynamic current in the coil allowing for natural peaks at high average volumes and greater dynamic power handling. Linear cone excursion is maintained out to and slightly beyond the normal excursion limit. No compression here and with the large radiating surface of the cone tweeter excursion is kept to a minimum even in these ideal conditions. The woofer also maintains superior dynamic capabilities with its enclosure dedicated to maximizing its linear excursion capabilities. Operating as a piston over its frequency range insures that a linear velocity is present right through the crossover point with compression far from the driver’s output even at high dynamic levels. Long term listening is invited with the Majestic Diamond II™ audio monitor even at high levels without fatigue. The Majestic Diamond II™ is also the ideal near-field studio monitor capable of discerning even the finest detail without excessive levels. This important characteristic allows use in smaller listening rooms with audiophile quality especially when positioned properly. Off axis listening maintains the soundstage almost as if you were still centered and you can stand, sit or be at floor level and still experience precise sound quality with a good soundstage. This is not an accomplishment to be taken lightly when choosing a speaker for your lifestyle. You will even find yourself moving around without missing a single enjoyable note of your favorites. Today we assume that enjoyable sound is only possible with perfect analog or digital sources while many less quality sources provide us with the music we love. The Majestic Diamond II™ will have you looking for and listening to all of your favorites regardless of the recording era quality or the medium. Sources such as digital streaming radio, mp3s, FM, tape, and phono will surprise you with their musicality and audible detail. The Majestic Diamond II™’s neutral low frequency roll-off makes it a perfect match for a quality subwoofer if needed. Quality sub designs will benefit from the coherent low frequency output of the Majestic Diamond II however you will only get close without non resonant technology in the subwoofer design. While both the Magellan VI su and the Magellan VIII su work exceptionally well with the Majestic Diamond II™ a subwoofer is only necessary if the room requires it. A single or pair of the Magellan VIII su mated with a pair of Majestic Diamond II™ audio monitors represents one of the finest audio speaker system available today regardless of price and its amazing properties can be enjoyed in almost any listening room without room treatment when using quality components. If you are just upgrading your speakers from your old mid-fi system, you are in for a wonderful surprise when you hear how good your original components really sound.